Flow of a liquid may take place either as open channel flow or pressure flow. Pressure flow takes place in a closed conduit such as a pipe, and pressure is the primary driving force for the flow. For open channel flow, on the other hand the flowing liquid has a free surface at atmospheric pressure and the driving force is gravity. Open channel flow takes place in natural channels like rivers and streams. It also occurs in manmade channels such as those used to transport wastewater and in circular sewers flowing partially full. Know the differences between laminar & turbulent, steady state & unsteady state, and uniform & non-uniform open channel flow. Be able to calculate the hydraulic radius for flow of a specified depth in an open channel with specified cross-sectional shape and size. Be able to calculate the Reynolds Number for a specified open channel flow and determine whether the flow will be laminar or turbulent flow. 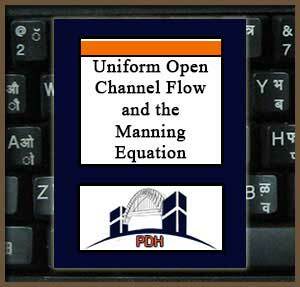 Be able to use tables such as the examples given in this course to determine a value for Manning roughness coefficient for flow in a manmade or natural open channel. Be able to carry out a variety of calculations for full or partially full flow under gravity in a circular pipe.